Tell me. 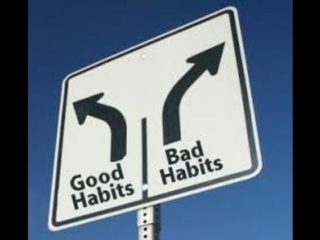 Do you have more good habits, or bad habits? 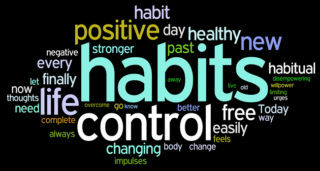 This may sound obvious but it is important to note, and use the insight, that habits serve us in many ways, their mechanism is “perfect” in that it produces the results that are properly practiced in (whether consciously decided or not is irrelevant) and then they operate “perfectly” in the absence of something that interrupts the habit-program. Their “goodness” or “badness” of a habit relates more to our opinions about the results created at a particular time, than how they function, or what their specific adaption was for. In a world where we are encouraged to think that we are thinking, when we are only confirming our preferred “take” on things, and our primary narrative creations act to create post-facto rationales to prevent change – we have our work cut out for us. The bottom-line here is that you are always either reinforcing the system you have allowed to perpetuate to this point in your life or your are crafting the habits you have to work better, and creating and maintaining new ones that have greater utility for pursuing what you want – there is no standing still as it’s simply not how the body works and it is not how the Universe works. Everything is changing and the process of life is inherently dynamic. The only place where a kind of fixed stability occurs is in the human mind, proactively shaping and filtering inputs in order to exclude messages that don’t fit within its pre-established preferences. Your habits both allow for a degree of ease and consistency in your affairs and also how you prevent yourself from being free to learn anything swiftly and easily, or make changes as and when you please. Up to now, we have been concentrating in fairly 1:1 ratio between goal and habit to create the goals, but now we need to look higher and more expansively across domains. In a study on “happy families”; it was reported that families who enjoy each others’ company, get on well, have fewer nasty scenes, etc. share a characteristic which is notably reduced or absent in more dysfunctional families and that is the happier families created more “rituals” – habituated group events which focused on enjoyable interaction, and their function as a group. This means they build in special events and activities as a part of their day to day flow. One of simplest being eating as a family, while sharing loving and supportive conversations (parents who have their emotional needs sorted so they can concentrate on the children). Families with more “rituals” and means of relating, means they have a stronger reservoir habits to fall back on to restore a sense of normality when life events unsettle them (deaths, disasters, problems etc.). Our habits and rituals become the capacity or reserve of strength that we can rely on in difficult times. For instance, what is ANY English success built on? Tea. The ritual of “a nice brew” has held more English people together through good times and bad than anything else. For many people it’s a built in self-calming and self-soothing ritual that is highly habituated. Some people know how to use the Great English tea ceremony to great effect. The “good” rituals need care and attention as much the “bad” need weeding and adjusting. Physical and emotional resilience (the ability to bounce back and recover following challenge), channeled through persistent forward movement, leads to success. The truth of success for most people comes down to staying focused and staying proactive, pursuing worthwhile goals. There will be habits you have that support you in this, and those that don’t. I want you to reflect on your habits that enhance, and habits that inhibit, your physical and emotional resilience, your staying focused and active, in pursuit of goals. Look at how you look after yourself – health, well-being, mental sharpness and rest, and any other things that you use to support your best health and well-being. Make notes. Look at what restores and nurtures you. Make notes. Look at how you stop yourself performing at your best – at what you do specifically (e.g. not “I sabotage myself”, instead “I don’t like stepping out into the unknown. I like to know everything up front, so I distract myself when I’m uncertain”) Look at those things that you know are slowing you down or getting in your way. Make notes. Take a look at your notes and make some decisions for change that will build your resilience and reserves. Plan for change right now. Put the most important changes into your planning NOW. When we say “External Reminders”, what we mean is any object or arrangement designed to tweak our awareness, either softly or with a big old “THWAK!” to the head, as a matter of design, to encourage connection with performing or executing a specific goal or activity. 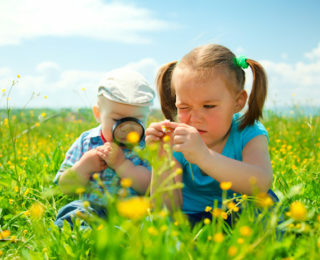 In numerous studies, a connection between associations of features in an environment with a specific behavior will influence the subjects in the desired direction. Even flashing words associated with strength, agility and youth near subjects who are performing an otherwise unconnected task (and irrelevant to the actual study) will cross a lengthy corridor faster (the real test), than subjects who had words associated with age and weakness flashed in their environments. In other words – environment counts. Is this such an outrageous notion? For decades business people placed photographs of their families on their desks. Today… anything goes – one’s pet, one’s car, etc. – these are memory prompts for what is important and, perhaps, temporary moments of distractions from the horrors of contemporary office work. Beyond reminders to pick up milk on the way home, how we organize and adorn our spaces can be powerful reminders, even when we are not consciously aware of them, of what we are working for and where we are going. Imagine that how you organize your home and office is already influencing you… what is it saying? Is it a mumble, a shriek or a kind of rheumatic wheezy clearing of the throat? I’m sure you are aware that extensive studies have been on the impact of color and shape on emotions. Now we know that even “knick-knacks”, and posters and objet d’art have a subtle influence on us… so we use that to our advantage. You will recall when we spoke about using Post-It notes for placing phrases on them. Now we extend that notion to include anything and everything that reminds us or prompts towards focusing on and recalling what is important to us. I’m reminded of a story about a person setting up a business in Taiwan who, while using the services of a Feng Shui consultant to “enhance the qi flow” of the office, failed to understand why the consultant was “junking up” their place with ratty old symbolic nonsense. 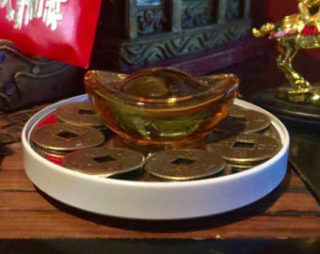 One of these ratty old pieces of nonsense as the guy called it, was a beautiful, antique lacquered bowl, 1/3 filled with tiny black seeds, and then three antique Chinese coins, intricately tied together with red thread, standing in the seeds. The instruction was that the bowl had to go in a specific place on his desk and the desk had to be kept clean. When considering his goals and directions and what he was seeking, it turned out he wanted build his business so that he could make a better legacy for his children than he had received. Now, the businessperson begins and ends each day gently wiping dust from the bowl, and making sure its area was clear and it was where it should be. It became clear he had changed his mind about the Feng Shui. It wasn’t old junk, but a powerful reminder. The “bowl incident” as he called it later, became a significant reminder that became a conscious ritual. They don’t even have to be that. Another successful woman used post cards from cities she had visited and small, meaningful items from each place (NOT hotel ashtrays) arranged in her home office and she said it made her feel more focused on what she was doing for the future. You can use anything to create and enhance your environment to subtly or more boldly remind you of the what’s, why’s, and how’s of what is important to you. Take your biggest or most important goal or project. Think about what it will be doing for you, getting for you or giving you if you are successful. Think about the words or concepts associated with that and write them down. Find the best word that evokes them all, but in one word. Use your environment, craft it, and let it inform you while you are otherwise occupied. This is a subtle-wise hack but very powerful robot-judo. Give it a try. Curiously enough (or not), habits are powerfully triggered in contexts and environments. It’s like the environment is the “get ready” message for specific collections of behaviors, and then the specific triggers in the environment do their job to call up ‘this’ as opposed to ‘that’ behavior. And this works just as “unconsciously” as any other form of triggering. Just walking into a room can begin a chain of behavior that either helps or hinders our intentions… and that should be a hint to the wise. “A piece of behavior” that you want to work with may actually start somewhere other than say… your desk (for a work habit). You may need to think a few paces “outside the box” when looking to change a routine or behavior. This knowledge can help when we are looking to create change, as there will be particular environments we need to pay attention (and perhaps modify or change) when we want to create a smooth change in behavior. This is why times of transition (moving to a new house or office; redecorating; going to college, going on holiday, etc.) have been demonstrated to be excellent times to create behavioral changes. We are forced to leave the robot’s auto-pilot and go back into conscious and intentional behavior. 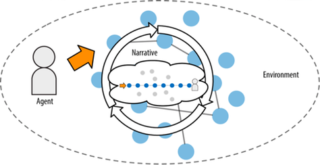 New behaviors can be “snuck in” in the general cost of remaining aware to deal with the continuous stream of novel situations requiring us to make decisions. You don’t have to move to a new house to make changes though. Some people have noticed how they feel better and more willing to work when they’ve tided up a bit. Curious, no? Perhaps the weight of habits tied with too much stuff you aren’t using creates a drag. It can be an incredibly useful exercise to have a look at the changes you want to make (perhaps using some of the lists we made in earlier episodes?) and sort them by the locations and contexts where you use them, and see how they fit together within the context itself. Have you optimized the locations for what you want to do? Removed distractions – visual and otherwise? Are you using the same arrangements of space and the environment as you were one year ago? Five years ago? Ten years ago? Again, sometimes you only need to make small adjustments to create a big impact. I am sitting two feet away from where I sat a week ago, having rearranged our workstations for better workflow in projects, which has made it much easier to access everything I need. It feels like work is smoother, which makes it much more pleasant and enjoyable. I just seem to enjoy it more this way. And there was no visualizing myself on any kind of screen at all, no heroic changes in internal dialogue, no deep and meaningful conversations with my unconscious – just getting the environment lined up better with intent and functional needs. It’s much easier to slide changes in with making the environment more appropriate and fit to purpose. I’ve changed the size of the office clock (bigger) and its location, to prompt more time awareness into our workflows and it’s had a very interesting effect. The first few days were ANNOYING (“Get that bloody clock out of my f&3%ing face” the robot grumped) but now, it’s actually comforting rather than confronting. We’re going to concentrate today on the environment or space. In the next episode we’ll deal with doing things within the environment. Have a look at the list of changes you want make in relation to an important project you are working on or a longer-term goal. Sort the various behaviors into the environments or locations where you use them. Look for patterns in the behaviors like sequences and order within each environment. See what kind of shifts, adjustments or changes you might make in the environments to support your goals, or to smooth or ease the changes. You might make some sketches, or write out the changes, or go into full “changing-rooms” mode, or add something to your project list. It takes 21 days to form a new habit… maybe not. Maxwell Maltz suggested this in Psycho-Cybernetics (1960) – along with visualizing goals and few other pieces that are now standard personal development concepts. The problem is… that current research suggests that the time it actually takes to change a habit varies depending on the habit, the context, the meaningfulness of the goal, etc. etc. The average time in a recent Stanford University study was… 66 days. Don’t worry, we’re not starting a bean-counting exercise and we’re also not about “instant fix” vs. “digging out the ROOTS” of change. We never “fix” habits (they ALWAYS work perfectly – it’s US who doesn’t like the results some of them create, but in themselves habits work just fine) nor do we “dig out the roots” as habits are also not weeds, and have no roots at all. Placing an agricultural metaphor on top of an imaginary psychological model says nothing about habits or learning, and everything about adding unnecessary overheads to the process of change. Some things are quicker for you to work with, and other things will take more effort. It’s not the speed; it’s the permanence and fitness for purpose we seek. We’re in it to build more robust and useful prosperity systems, which will ultimately become self-correcting, when the right skill sets are acquired. You see, if you learn how to let go of what no longer suits, and stop defending it, and focus on the results you want to create instead, and the process of “working it” until you succeed; the changes are guaranteed. It’s that little word “until” (rather than “if”) that signals commitment to some sort of principled action. The speed chasers seem to suffer a lack of commitment to their own prosperity and how it is only and always created. Greedy for results without skill. Wanting to wiggle-waggle their little wands, make themselves feel better for not being as big and cool as the TV ads say they could be or should be. The desire for un-earned success is one of the open doors to being fleeced by confidence tricksters. And the first person pulling the wool over their own eyes are the speed chasers themselves. Why be a genuine fake when you can be a genuine success? Turn time into a resource to be invested wisely on a daily basis, use your weeks and months to moderate and govern yourself, so that the changes and learning can be consistent (with a great upward tick on the graph, if you’re keeping score) and, as you shore up and revise your system of habits, they become supportive of you making further changes – always heading for a better and better way of life. You see, it’s not about time at all. The process of building a better and better system doesn’t end. It’s about making life great regardless of circumstance; It’s about finishing and finishing and finishing with those bits of the past that have been hanging out as robot-programs – replacing them with habits that turn and turn again towards what is important to you now, for the future. If your ambitions are about money or “making it” or “becoming BIG”: Ask any really wealthy or “successful” person (who will speak candidly about their experience), and you will discover NOT a soaking-slick super highway memoire journey but instead you will hear about colossal ups and downs, great losses as well as gains (and not few complete busts-back-to-the-starting-line events), humiliations and betrayals, as well as peak moments. It’s not about “quick” and it isn’t even about permanent (the existentially-terrified seeking of a kind of security that doesn’t exist in this world). The reality of reality is that regardless of seeming conditions and their fluctuations; life continues. We build better prosperity systems to be happier and more adaptable regardless of circumstance. We build better systems so that we can always turn to something more desirable or useable or enjoyable at any time we wish. We build to make the things we think we need or want into reality. We build to find out how we can adapt to the world successfully AND how to make the world successfully bend to us. Building a Prosperity System is about abandoning the adolescent fantasies and trading them in for the real thing – accomplishment, enjoyment and wide open potentials. We get to build the habits that make change easy; while moving towards what it is we say we want. One of the great joys you will discover if you do this work thoroughly, is that one day you will just decide that “today’s the day” and you will do things differently than you’ve done them before, and some big thing or behavior you’ve put off working on will just change. It will seem like magic but it will only be that you have put in enough examples of one (or more) of the principles, and your brain “gets it”, and the robot will click-whirr and there it will be. It will not be “magic” or “covert change” or “unconscious processes potentiated by priming” or “resolution of subconscious complexes” or any of the nonsense passed round as profundity on the internet. You will do it because you want what you say you want, have thought it through, “hooked it up” to many other desirable consequences, figured out the resources needed, and then just simply… want to get on with it. Obstacles and problems will be just grist for the mill (“The business of business is solving problems at a profit” – The One Strategy That Always Works To Build A Business). We are set up to do things without coercion under certain circumstances. The fact that coercion makes up such a large part of our educational and political systems (and often families as well) means we have suffered quite heavily from this “alien”/outside/other programming. We are working to take the coercion out of ourselves, stop doing what only breeds resistance, and only do what works. But for most of us it will mean re-orientating our minds to efforting in a different way than we did. But it is workable, relatively low-energy cost, and it becomes more and more enjoyable as time goes on. When you (and the robot) finally get it – “the past is just a good-bye”, as Crosby, Stills & Nash put it. Dropping whatever you don’t need will seem natural, and picking up something new will be (ho-hum) just another fascinating adventure in discovering new possibilities. So…how long does it take to change a habit? No time at all, and also forever and ever, and it doesn’t really matter. Use today to look back at what you’ve got going well in your Prosperity System, and also what you haven’t got into yet or haven’t done. Optimize (make better) what is working well. Then begin working on one of the aspects that you haven’t done as well with. Apply the principles to the principles. Figure out a goal or project, figure out the process, resources, etc. … make it work.